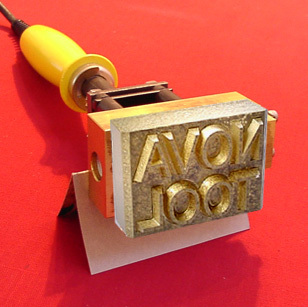 Hand held or drill press mounted commercial duty branding irons with characters only - no art required. Available as flame heated or as electric from 200 to 1000 watts at 115 or 240 volts (Higher or lower wattages available on special order). For branding dies up to 20 square inches. Character sizes from 9 pt (about 3/32 high) to 2 inch standard. Larger sizes also available. The table below shows approximate prices for flame heated irons. Final price depends on number and size of characters.